Our Q&A with August speaker, John Cook, who will be talking on the topic of Community. [CreativeMornings (CM)] How do you define creativity and apply it in your career? 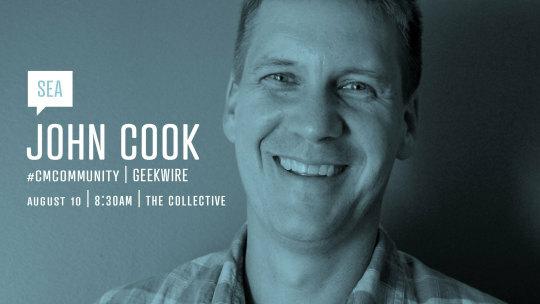 [John Cook (JC)] Creativity takes many forms at GeekWire — from crafting a compelling story idea to hosting a new event to concocting original business concepts that drive a fast-moving media business in 2018. For me, creativity manifests itself best when you have smart people crafting new ideas. Group collaboration can help creative ideas flourish, as we’ve seen with GeekWire experiments such as our GeekWire HQ2 project in Pittsburgh or the growth of the GeekWire Summit or our new Elevator Pitch video series. At its core, creativity is the birth of new ideas — but to me the real power comes in the smart execution of those ideas. (CM) Where do you find your best creative inspiration? (JC) All over the place. I am not sure where creative inspiration comes from — to me it is kind of like spotting a good story. Your flag just goes up. It’s an innate sense. The hardest thing for us is balancing the creative ideas with the tactical operations of running the business. But we find creative inspiration in all sorts of places — group brainstorms, sponsors, listening to smart people, watching what others are doing, etc. And, of course, I also find creative inspiration in the shower. (CM) What’s the one creative advice or tip you wish you’d known as a young person? (JC) Don’t wait around — take action and make something happen. My only regret is that I didn’t start GeekWire earlier in my life. In my mind, becoming an entrepreneur is the most creative outlet, since it tests your mettle every day. (CM) Who would you like to hear speak at CreativeMornings? (JC) We’ve organized dozens of speakers at GeekWire events over the years, and some of my favorites include entrepreneurs, innovators and iconoclastic thinkers like: Todd “The Quadfather” Stabelfeldt; skydiver Luke Aikins who jumped from 25,000 feet without a parachute (and lived to tell about it); Fred Hutch research Dr. Jim Olson who is using scorpion venom to wipe out cancer; former Navy fighter pilot Missy Cummings who is paving the way to a new autonomous world; and many more. (CM) What did you learn from your most memorable creative failure? (JC) Before starting GeekWire, Todd Bishop and I stumbled with another online news organization that we created in partnership with an established media company. From that experience — kind of a mistimed baby-step into entrepreneurship — I learned that we were better off placing a bet on ourselves than relying on outside partnerships for us to find success. (CM) When you get stuck creatively, what is the first thing you do to get unstuck? (JC) My mom — a newspaper reporter for The Akron Beacon Journal who covered courts, cops and the small rural community of Wayne County, Ohio — gave me the best advice for dealing with writer’s block: “Just get something down on paper. Who cares if it is no good, just start writing.” That advice has always stuck with me, and over time I have condensed writer’s block — which I still get — from hours to minutes. I find myself getting frustrated if I am not writing something in a few minutes, and I revert to my mom’s advice and just start writing.